Description: 1687th-The shrine of Golden Mane is a point and click adventurous escape game developed by ENA game studios. 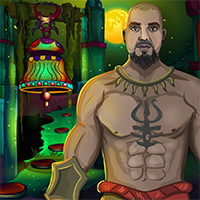 As instructed by the real scorpion god, continue your journey in finding the pillar stones till the god finds the location of the device that can be used to destroy the demon god. In this level you will have to deal with deadly traps, cunning puzzles and hidden objects to find clues leading to your missing girlfriend, the tough path is ahead.